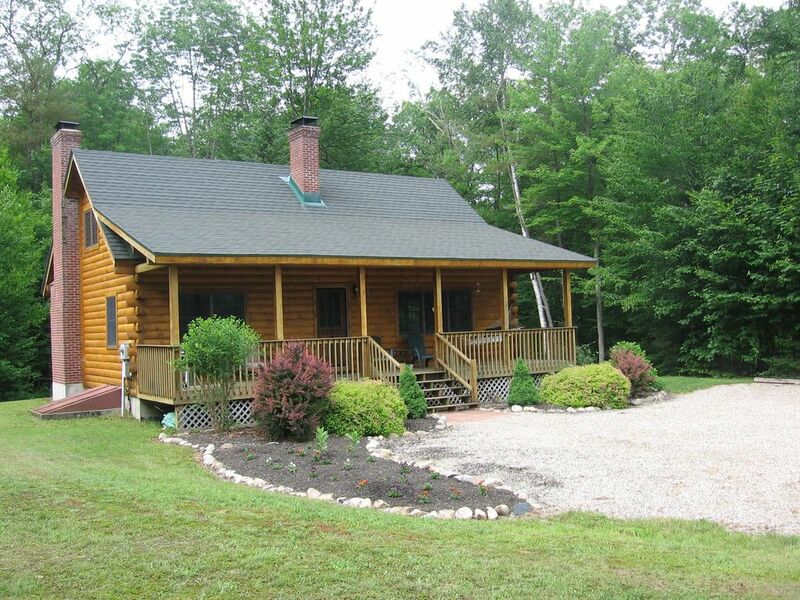 Classic Log Home on 6.5 private, secluded acres. 20 minutes to Loon and Waterville Valley, close to Franconia Notch, 25 minutes to Squam Lake. Gorgeous mountain views, babbling brook, 5 minute walk to 30-foot waterfall. Also, it’s only a 5-minute walk to swimming pond and tennis court. The property borders the White Mountain National Forest. There are two large bedrooms plus a loft. Large country kitchen/living room. Farmer’s porch with hammock. Fireplace in Master Bedroom, wood stove in living room. Mitsubishi mini-split heat pump/ac system, with Monitor heater as backup. Fully furnished with a queen-sized bed in the master bedroom (plus a full sized sleeper-sofa), queen-sized bed in the second bedroom, a double bed futon sofa in the loft plus a chaise lounger that converts to a twin sized bed. Two full bathrooms. Full heated basement. Seasonal rentals considered. Pets considered. The main mountain you see from the front Porch is Mt. Tecumseh, which is the ski mountain for Waterville Valley. We're looking at the back side of the mountain. cell service signal is strong, so cell phones are easily used. Wood stove, plus two efficient Monitor heaters (one in the basement, one in the living room). Mitsubishi heat pump/ac system heats and/or cools house well. high speed internet is not yet available, but there are plans for it to be available soon. Smart phones can easily access the internet, and you can use your cell phone as a wi-fi hot spot. High definition TV in the living room. Upstairs and downstairs bedroom have smaller TV's. Many board games are provided. An extensive CD collection is housed at the cabin. Owl's Nest Golf course is approximately 10 -15 minutes from the house. Jack-o-Lantern golf is about 10-15 minutes away. 2 queen beds, one full size futon sofa, one twin size futon, one full size convertible sofa. We had a wonderful time at David’s cabin. We only saw one couple snowshoe by the entire time we were there - exactly the amount of seclusion we were hoping for. The dirt road drive up to the home was so fun! It was snowing and truly looked like a winter wonderland. David provided us with so much information about the home and surrounding area before our stay and was so communicative - we were beyond prepared for our first trip to NH. The cabin was perfect for just me, my boyfriend, and my dog but there was plenty of space for another couple. The fireplace in one of the bedrooms and the wood stove were my favorite. David kept us well stocked with firewood. It was mesmerizing to watch the snow fall throughout all the open windows of the first floor. We would love to stay again! The cabin was cute and cozy and had everything that we needed. David was very informative and sent instructions to explain everything. We enjoyed snowshoeing and visited the waterfalls and the pond. Very nice spot off the beaten path which I think makes it even better. Well maintained and thought out and David is a great host! The cabin was comfy and cozy, we stayed warm while it was below freezing when we stayed. Plenty of space and the Mountain View’s were amazing, looked like a painting! We walked to the waterfall, it was so beautiful. Even with the ice and snow. We will definitely be back next year! My husband and I spent 3 nights and enjoyed every minute. It's so private but close enough to hiking and cross country skiing. We can't wait to come back. Wow! An amazing epic vacation with my family in the beautiful White Mountains of New Hampshire. The host of the cabin (David) was great and provided us with plenty of information well in advance before we arrived. Driving into the White Mountain region alone is an epic experience, but once you turn on the road which is close to the cabin, you will eventually begin to drive on a nice dirt road and enjoy the beautiful scenery of nature including the surrounding mountains once you arrive at the cabin. From the relaxing smell of the wood burning in the fire of the wood stove or taking a small walk in the back of the cabin where you are able to enjoy the relaxing sounds of the flowing river, this is a cabin I would love to revisit again and again and again. Thank you. Movie video collection, games, literature. Hiking, cross-country or downhill skiing, 10 minutes to Owl's Nest golf and Jack-o'-lantern golf, or just relax in the hammock with a good book and listen to the babbling brook.